Vicki once suffered from all of these symptoms. Her chronically deficient first chakra created a long list of issues that made her life a constant battle. The good news is this — her struggles motivated her to discover the best ways to consistently and positively shift first chakra energy. Now, she’s sharing her life-changing secrets with you! 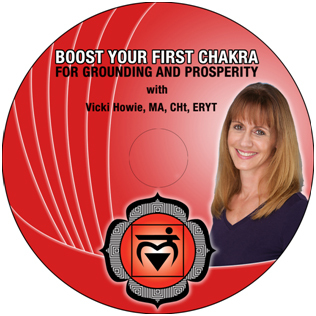 Vicki’s program includes all the same tools and techniques she used to boost her own first chakra – so she knows it will boost yours! This 4-Module, 2 hour+ course is jam-packed with exercises, games, meditations and information that will guide you from a weak first chakra to a robust life of grounding and prosperity. There’s even a quick and easy assessment to determine the current state of your first chakra. The number one problem with most prosperity and “Law of Attraction” programs is they only give you upper chakra techniques – like visualization and affirmations – for a first chakra issue — manifestation. That’s like using a parachute as a sled – or something even less wise, using a sled as a parachute. Sure, you can do it, but it doesn’t work very well. That’s because parachutes are meant to be used in the sky (upper chakras) and sleds are meant to be used on the ground (first chakra). Don’t misunderstand, there’s nothing wrong with visualizations and affirmations. They’re potent tools – and they’re included in this program as well – but Vicki pairs them with games, exercises and meditations that ground them down into your first chakra. “Boost Your First Chakra For Grounding and Prosperity” is 100% guaranteed. At Chakra Boosters, we want you to be happy, healthy and moving toward your highest possibilities. Once you’ve completed the full program, if you’re not pleased with the results, just let us know why (so we can continually improve), and request a full product refund within 30 days of purchase. We’ll gladly give you your money back. We want every purchase to be win-win. So, you’ve got nothing to lose, and everything to gain. 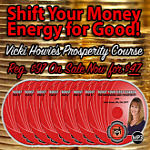 Step into your new life of grounding and prosperity right now. DOWNLOAD this powerful program NOW (no CDs) and start listening to it and experiencing more first chakra energy today. Over 2 hours of root chakra exercises, grounding games and meditations.